November is over and I don’t have a finished sweater to show you. I am a NaKniSweMo failure. Truth be told, I pretty much thought this would be the case. It’s okay, though, because I actually got a lot of this sweater finished in November. I could show you a photo but it would really just be a big pile of blue yarn. 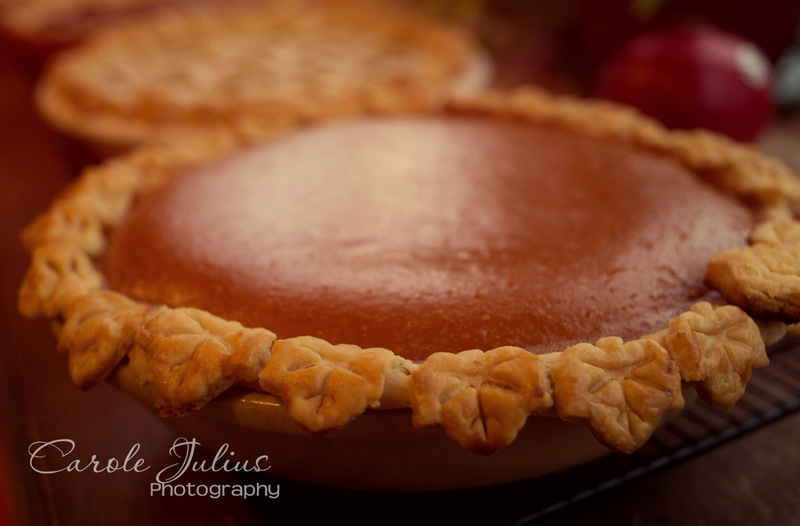 The photo of this Thanksgiving’s pumpkin pie is prettier, trust me. Anyway, the body is done and so is one of the sleeves. I have started the other sleeve and once that’s done all that’s left is the collar and button bands. Given the fact that sweaters generally take me months and months to finish I’m pretty happy with this progress. I just don’t know what to call it. That pie is gorgeous! The crusty leaves make it, and there are no splits! Amazing. If you finish the sweater this month, it is NaKniSwe2mo. Otherwise, revert to mos. Beautiful pie! Love the leaves. Your pie is gorgeous; the leaves make it almost too pretty to eat! I don’t have any suggestions for what to call your sweater. All I hear in my head with NaKniSweMo and NaBloPoMo is Robin Williams saying “Nanoo, nanoo”. Maybe you could call it Mork? OMG, are those little cut-out pastry leaves? The evidence of this and the gorgeous apple pie suggest that you should go into baking and rival Martha Stewart! I’m with Mary … between this and the apple pie tree, I am in awe of your decorative pie making abilities. As for the sweater, the last time I tried to do NaKniSweMo, I didn’t have a finished object until February. So you are not going to get any shade from me. You are not a failure! You did more in a month than the others who finished their sweaters on time! Did they bake 5 pies, decorate a house, sell Christmas trees, etc., etc., etc.? Mmm. Pie. Did you say something else? It looks like we all concur–you are an artist with pie crust. As to a name, nothing to worry about. The sleeve, collar and buttonband, worry about smile! Mmm, pumpkin pie. NaKniSweMos — then there is no pressure. No matter what you call it – you got a lot of progress done and that is amazing! Do you like your sweater so far? That is the main thing—do you have a good feeling about it? I’m having serious pie baking envy right now! Beautiful pie! I would have never been able to cut into it and destroy the prettiness. Those are the prettiest pumpkin pies ever! Do you have a trick for no cracking?